Congress general secretary Rahul Gandhi Saturday tried to woo Uttar Pradesh's Muslim population ahead of the 2012 assembly elections by assuring them that a new reservation policy would soon be in place for them. "We will keep our commitment of providing reservation to minorities in the state," Gandhi told a gathering of party office-bearers at the state Congress headquarters here. "We will do it soon," he declared amidst applause. Gandhi is on a two-day visit to the state capital to interact with party functionaries as well as candidates handpicked for the forthcoming polls. 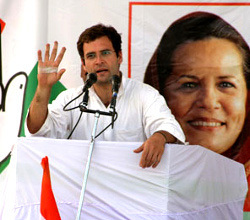 "You must understand that the Congress was getting back to the main arena of elections in the state after a gap of nearly two decades; we were virtually out of the political battleground between 1991 and 2007, after which we got down to re-building the party from a scratch," he said in a reminder of his active involvement in state affairs in 2007. He called upon party members to work hard for victory in 2012. "If you all take a vow and have the determination to win the coming election in Uttar Pradesh, I am sure nothing can stop you from attaining your goal," he said. Gandhi also warned against infighting. "We must fight the election unitedly," he said.